This gallery is packed with drama, adventure, ingenuity and boating fun. Delve into the Great Lakes’ most spectacular ship raising, explore underwater shipwrecks, admire a snappy motor launch, browse a collection of more than a dozen engines, see the very first Marine Travelift ever built and trace the history of Chris-Craft, America’s oldest power boat builder. Plus, take in Jim’s Boat Shop – a building space where local residents hand-construct a new boat each year. On a winter Saturday, you might even be asked to lend a hand! The raising of the steel ore carrier George M. Humphrey by the enterprising Capt. 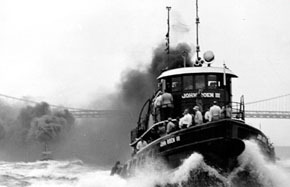 John Roen of Roen Steamship Co. in Sturgeon Bay is Great Lakes legend. Capt. Roen’s feat is fully documented and includes a decompression chamber and hard-hat diver’s outfit used in the actual salvage operations. Roen was able to repair and use the Humphrey, plus sell the 11,000 tons of ore aboard the carrier! The Humphrey remains the largest boat ever raised from the Great Lakes. In the early 1900s, sleek power boats were the stuff of Hollywood types. It was Chris-Craft who ushered in boats that everyday Americans could afford. A 1928 Chris-Craft model is docked in the gallery, complete with a touch-screen display that traces the company’s history. 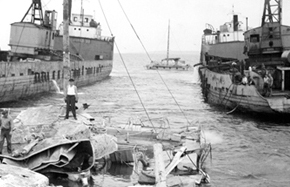 The ingenuity of Marine Travelift to transport boats earned it a feature on the History Channel’s “Modern Marvels” show. An interactive display showcases Marine Travelift of Sturgeon Bay and how it shapes today’s marinas. Unfortunately, not all ships make it back to port. A shipwreck kiosk takes visitors underwater to see the remains of wrecks that dot the bottom of Lake Michigan. And, each has its own tale to tell. For gear heads and those who love anything mechanical, the engine room boasts an amazing collection. See a Kahlenberg semi-diesel engine, which pioneered the transition from the steam era to high speed full diesels on the Great Lakes, and an antique outboard motors collection.